When I first became interested in steampunk last year, I posed a question to one of my friends. Pause right there. I wasn’t referring to America. Or was I? Yes, my friends and I are from the US and steampunks, and most identify our personas as being from the “Colonies.” Yet their idea of what the Colonies represented in steampunk—aka an alternative America that was still under control of the British Empire during the Victorian Era—and my interpretation of the colonies—aka the actual ones that had existed during the Victorian Era—were vastly different. Which leads to the questions I’d like to explore here. Why is the concept of the United States as a colonized America so appealing to steampunks? Is this notion damaging to steampunks of color (SoCs), whose histories are negatively intertwined with the realities of colonialism? Does the idea of a colonial America promote or denounce the imperialism that existed during the Age of Empire? I suggest two interpretations of the concept of a colonized America. One represents an idealized harmony fueled by the American fascination with (or, as some might say, fetishization of) British culture. Here, I refer to this fascination as Anglophilia, which, according to the Merriam-Webster dictionary is defined as “a person who greatly admires or favors England and things English.” Anglophilia is a term that can apply to any person of any country or background who fits this definition, but for the purposes of this essay I’ll only refer to the particular US-based Anglophile perspective, and not to the Anglophile community as a whole. American anglophila stems from the common ground that both American and British culture share, both linguistically and historically. American interest in British culture has also been long-standing: from admiration of British writers that were considered the masters of Western literature to today’s entertainment figures in current pop culture. Examples from the past forty years feature a wide range of British cultural figures that have become American obsessions as well, including the Beatles, James Bond, Dr. Who, Monty Python, Princess Di, and Harry Potter. In addition, Americans envision British culture as being more intelligent, more polite, and more dignified than their own. Plus, those charming accents never hurt. The steampunk aesthetic movement gave American steampunks another outlet to express their Anglophile tendencies. If American steampunks can’t pretend to be British themselves (though some steampunk personas have no hesitation in doing so), then Americans can at least re-establish that lost-long connection to Mother England by re-creating the former colonial connection. And maybe, by some sort of historical/cultural osmosis, we can regain that Victorian elegance we had begun to lose when we did that silly thing with the tea and the protests and such. This is the nostalgic interpretation of Steampunk, an interpretation that is further explained in Cory Gross’ essay “Varieties of Steampunk Experience” in Steampunk Magazine, Issue #1: “Nostalgic Steampunk is the idealized Victorian Era, the nineteenth century as it ought to have been. Nostalgic Steampunk revels, much like Victoriana itself, in the elegance and the spectacle of the Empire. It forgets, or chooses not to remember, the dirtiness and the imperialism of this same Empire.” (65) An idealized colonial America fits in with this nostalgic viewpoint: in this world, the causes for American rebellion against the British Empire – among them being the Proclamation of 1763, which limited landowning beyond the Appalachians, the increasing amount of taxation without representation, the rise of John Locke’s ideas of social contract and a republic form of government, the forced housing of British soldiers in people’s homes etc— are all forgotten for the idealized notion of America keeping its British roots. This ideal is a flawed one: besides ignoring the harsh historical realities behind the American rebellion, it also disregards the reality that America never *had* 100% British roots. There were the native populations to consider; New Amsterdam, one of the first major European settlements on the US eastern coast is Dutch; the southern parts of the United States were claimed by Spain and France first. But perhaps this vision of America, “England’s darling across the pond” is not the one upheld by American steampunks. This second, more negative interpretation of America’s relationship with England is also evident in steampunk creative culture. Even in our imaginations, the relationship between England and America is not a loving one, but one where the English still have their noses turned up toward their American cousins. In Gail Carriger’s steampunk fantasy Soulless for instance, the American colonies were the rebel children that broke away and became ruled by religious superstition, unlike reasonable, atheist England, and the English protagonist has the lowest opinion towards the clueless and awkward American scientist Mr. MacDougall. Indeed, the crass and forward American is frequently associated with the “Weird West” subgenre of steampunk: the most prominent representative of this steampunk archetype would be Lee Scoresby, the blunt, gunman from Texas, from Philip Pullman’s The Golden Compass. A second way of interpreting a colonial America, then, would be as an opportunity to explore the negatives of Empire by people of a nation who, in today’s modern culture, has become the most powerful in the world. To subvert the idea of today’s American supremacy by returning it to an alternative, chained colonial past would fit into the tenants of steampunk—defined as a subversive genre—perfectly. Michael Chabon’s “The Martian Agent,” featured in the Steampunk anthology edited by Ann and Jeff VanderMeer might be considered as a story that portrays a de-romanticized colonial America. Another subversive interpretation of colonial America can be found in the credible alternative history and re-drawn geopolitical map represented in Steam Century’s mystery games. Indeed, not only would the inequality of power (and the patronizing attitude) mostly likely be sustained between England and her American colony, but I will also acknowledge that the existence of an American colony can highlight the levels of institutionalized racism that existed during the Age of Empire. One level is the global geopolitial one. Out of England’s entire history of conquered and controlled territories, the American colonies got off the lightest while under British reign. Compare America’s colonial oppression with that of the Indians under the British Raj or the Australian settlers (and prisoners) versus the aboriginal peoples of Australia. Even nations and political regions who were not conquered outright by the British Empire but affected by its foreign policy of creating spheres of influence—like Central Asia during the Great Game or China’s Opium Wars—suffered lasting detrimental effects that I doubt an American colony would have had. Yeah, just sail around the world and stick a flag in. I suppose that is the magic of history. We can imagine it as we wish. We can simply ignore the facts in their entirety and craft an imaginary, historical fantasy world catered to our specific interests, in complete ignorance of the plight of well, just about everyone except for wealthy, white, male, straight, Christian landowners. But, for now, I’ll stay right here in the present and imagine a better future to come. As the saying goes, history is written by the victors; in steampunk, history can be re-written by the rebels. Steampunk gives SoCs the ability to imagine a better past: not by ignoring its mistakes or glossing over the stories of the silenced, but by re-envisioning a past, where, finally, our stories are included, our struggles are acknowledged, and the “magic of history” is imagined on our own terms. Already in this essay, I have mentioned a wide range of steampunk creative artists that embrace this philosophy. This interpretation fits in with the gaming vision of Steam Century, the political bent of Steampunk magazine, in addition to the most obvious modern example in the genre—William Gibson and Bruce Sterling, whose dark vision of steampunk in The Difference Engine is widely regarded as one of the genre’s keystones. Melancholic steampunk makes room for a messy, conflicted, complicated colonial America, but one that American SoCs and white steampunks can each recognize as their own. Some ideas of racial issues that would be fascinating to explore in a colonial, steampunk America: the role of the Chinese in constructing the American railroads; the early emancipation of black slaves in America when Britain abolished slavery in 1833, or even the transformation of the American South using steampunk technology to forgo the need for slavery at all; the relation between the British colonialists and the Native Americans over time. Thus, even with all of its difficulties and complexities, this colonial America gives both SoCs and white steampunks the voice and the opportunity to engage in creative dialogue with one another. This is our game, our turf, our rules—and there are flags aplenty in the realm of steampunk. Carriger, Gail. Soulless. New York: Orbit. 2009. Chabon, Michael. “The Martian Agent.” Steampunk Anthology. Ann and Jeff VanderMeer, eds. San Francisco: Tachyon Publications. 2008. Gross, Cory. 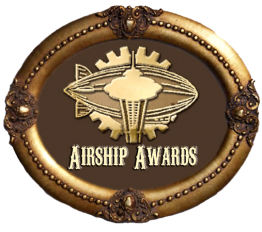 “Varieties of Steampunk Experience.” Steampunk Magazine. Issue 1. Izzard, Eddie. Except from “Dressed to Kill.” Cake or Death. Transcript by Mark Zastrow. Muse, Wendi. “Nostalgia: a Sport for the Privileged.” Racialicious. Pullman, Philip. The His Dark Materials Trilogy. New York: Random House. 2003. Said, Edward W. Culture and Imperialism. New York: Vintage. 1994. First, I absolutely loved this. Second, even as an American history major, your friend’s response to “colonials” made me go *thunk*. Compare America’s colonial oppression with that of the Indians under the British Raj or the Australian settlers (and prisoners) versus the aboriginal peoples of Australia. By America’s colonial oppression, context makes it sound like the *white* colonial oppression, — Proclamation of 1763, higher taxes, etc. Meanwhile you’re comparing it to the colonial oppression of what is, for the lack of better term, the “coloreds”. Britain and the colonists themselves were equally nasty to the different Native American tribes here, and I’m not sure if there was ever as deliberate an act of genocide in the other colonies as the British giving Native Americans blankets infected with smallpox. And you’re right about the brutality of the colonizers over the natives in a colonized land: that was much worse than whatever went on between the colonizers and the mother country. white society was relatively rarely homogenized British. Australia might have been an exception, because it was settled so late and no one else wanted to be there, but India, Egypt, and many of the other colonies had a mixture of European cultures and ancestries in their “white” societies. I seem to recall that Irish people didn’t used to count as white. Over time, plenty of Europeans are now being counted as “white”. Including a subset of Middle Easterns who, I guess, have an Aryan phenotype that looks white. The white race thing, it befuddles. Irish people used to be considered worth much less than blacks. I think Jews only started to be counted as white sometime after the 1940s. Probably the year 1946, really. It’s not phenotype, not precisely, it’s genotype. Which is why, even though my skin is olive and I frequently get mistaken for Hispanic/Italian/Lebanese, I am officially white. Because it’s a useless, stupid categorization that in another twenty years — if not ten — will make no sense whatsoever. That makes sense. I…. have actually never heard “genotype” before. Fascinating! Thanks! Moar google love! Heh. I have an intense love of biology and history, which combined makes me realize that classification of “race”, period, is simply goddamned stupid. Even KA Applegate figured that out – I distinctly remember Jake saying Washington’s men sounded like they were from the South but trying to use a classic British accent. I have no idea if she actually researched that point (since the revolution happened before we had sound recording, or even a phonetic alphabet, how the heck would we know what they actually sounded like? ), but the idea of the British accent changing in America was there. And since when did being from the Middle East count as white? Is it because they think Jesus was white too? I remember talking about this in my sociology class – I don’t think the professor had an actual answer for why descending from the Middle East was considered white, but apparently it’s been a long standing practice. I think more academic journals should accept Eddie Izzard quotes. I know you understand the brutality of colonizers over natives — the anaogy just wasn’t quite parallel enough for me. Well, the Appalachia accent is supposed to be the “most” British of American accents. There could be steampunk-justifications for the accents being more, as you say, plumy — perhaps there’s more instant communication. The reason for the splintering of dialects is because there wasn’t anything to reinforce the original accent once people wandered off from the motherland. If certain steampunk has some sort of recording device or radio prior to when Americans would have had it, then there’s potential for British accents. For the record, Jesus would be darker-skinned than I am, as he’s purer Middle Eastern than I am. Throughout history, at least some Christians have recognized this. First, like Rachel, I must say that this=awesome. Quoting Edward Said and Eddie Izzard in the same article should totally be accepted…somewhere. Also? I’ve had next to no interest in Steampunk before, but now I really want to do Dutch!Steampunk. I want to trick out my old Dutch costume to be all Steampunk-y. Yeah, I have nothing academic to add like Rachel. I fail there. But this was definitely interesting – thank you!